For those riders that already ride in Freejump Boots, they are ahead of the curve. They enjoy unparalleled comfort, wear and modern styling. This combination of comfort and style is offered only by Freejump. But for those riders that are on the edge about Freejump Boots, one small piece of advise. Sometimes, boots look different on a shelf versus when worn by a rider. Give Freejump Boots a try. You will experience an unprecedented level of comfort and style. In fact, with most riders that make the jump to Freejump, rarely , if ever use their tall boots. Such is the allure of Freejump. Riders are tough on their boots. This means that boots must be comfortable and durable for all-day wear. Between the water, dirt and footing, the boots have to be tough to handle it all. Freejump Liberty XC EVO Boots are just that and more. A separate rubber lining sewn between the upper and sole of the boot provides added protection against water. 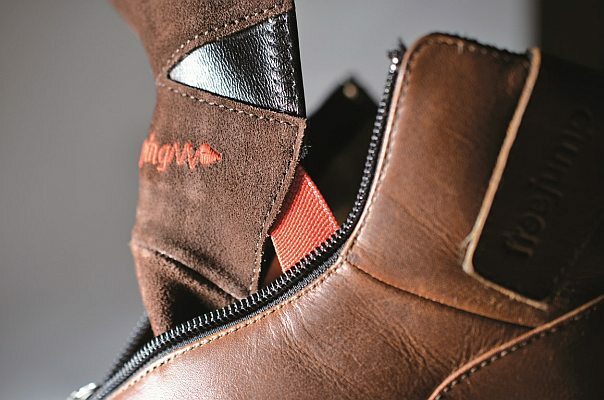 The tongue of the boot has been re-designed to ease an ergonomic fit. The shape of the tongue enables a contoured fit around the ankle. Freejump has always been at the forefront of innovation. The Freejump Liberty XC Boots now feature a centralized elastic jock strapping. This elastic band provides better ankle support (sigh for all those that have bad ankles). Freejump brings the best of technology into their offering. The boots also have a removable SIDAS in sole that is 3D shaped. SIDAS is a world-leader in in sole and foot protection technology. We all know that the sole is where the rubber meets the road. This part of the boot is essential to ensure good positioning which leads to good posture. This is exactly the premise of the 3D shaped in sole by SIDAS. The foot and heel stay aligned to enable better posture. Trust the Foot Experts at SIDAS to create products that eliminate toe and heel pain. Their 3D shaped insoles are designed for exactly that purpose. Whether your feet are low arch, medium arch and high arch, SIDAS insoles are the answer. When you start with a blank slate, it becomes easy to design a world-class product. Add in innovation, bring in the best ideas from other sports. Voila! The result is Freejump Liberty XC EVO : a riding boot that is ultra-comfortable and well-fitted. Watch this video to learn more about the exciting Freejump Liberty XC EVO Boots. Ready to Order? Buy your Freejump Liberty XC EVO Boots. This entry was posted in Riding Boots, Show Jumping and tagged freejump. Bookmark the permalink.